Rumors have gone abroad that the activities of the Old Comrades Association have been greatly curtailed and that sceptics are wondering whether such an organization is really worth while; whether the work of organizing and administering the Association is mis-spent energy; whether it is, after all, really more trouble than it is worth. Your personal attitude on the matter depends greatly upon your conception of an Old Comrades Association. A bunch of burns looking for a hand-out? A periodical gathering of booze-fighters? Just a fund, to be increased each year and held at Headquarters for some vague purpose? A sort of democratic social club which stages occasional smokers and banquets which one has to attend? Ottawa Branch feels that it has become a vital, living force for good in the community. It has been the means of setting several old comrades on their feet, helping them to the successful realization of their ability to make good. It has taken discouraged men with families, beaten down by the storms of civil life, living under terrible handicaps, with no future save that offered by charity, and has found them jobs, helped them over the thorny ground and given them a fresh start under favorable conditions. Isn't this worth while? Doesn't one successful experience of this nature justify all the trouble of organizing? True, the Ottawa Branch has given several dinners. Little, informal affairs, where Generals and. Privates have hobnobbed together, where the unemployed, discouraged chap gets a new lease of life, recovers his morale, feels that some people are interested in him, and realizes that we who have served in the old Regiment stick together through thick and thin. At these dinners, while respect remains, rank is forgotten and everyone meets on the same plane—men proud in the knowledge that they have helped in moulding the traditions of the best Regiment in the British Empire. Invariable in attendance at our Ottawa dinners is that splendid old R.C.R. officer, Major-General The Honorable A.H. Macdonell, C.M.G., D.S.O., and the Regiment's much-liked, warm-hearted friend, Brigadier A.C. Caldwell, Quartermaster-General of the Forces. At our last dinner, we had as the Branch's guest an old chap who was in the Regiment in France, but who is now unfortunately down and out for a time. With a family of six kids, he has had little chance of enjoying even a social bottle of beer with his old cronies. We had helped him in several ways and now we had him at our dinner. In accordance with our custom, the senior officers present passed around the different tables, spending ten or fifteen minutes with each little group. Everybody has a chat with everybody, and this old, worn-out discouraged veteran, like everyone else, hobnobbed with General Macdonell, Brigadier Caldwell, Brigadier Lister, Colonel Chrysler, Colonel Girouard, and the others. Need I say that his morale on leaving that restaurant was much higher than it has been for some time. We had given him faith in himself. He felt that he really was somebody, after all. He realized that we of the Regiment are definitely interested in him and. his worries. Standing on the steps of the cafe after the dinner, he was heard to say, "Well, if that isn't the best evening a buck private ever spent!" That is the spirit of our Old Comrades Association. To show a little more of the practical side of the work carried on by Ottawa Branch, let us glance at the case-sheets of men whom we have helped. Here is a man who served in the C.E.F. Battalion. Out of work due to war disability. Not in receipt of pension. Married with four children, 10, 8, 6 and 4 years. When visited by the Association Secretary, was behind in rent three months. Most of furniture had been sold to provide necessities. Though it was then December, no coal was in the house, which was cold and damp. No food. Immediate steps were taken for the provision of coal and food from Association funds. The City Welfare Bureau was interviewed and arrangements made for the work of the Association to be augmented by a grocery order. Bread and milk tickets were provided. His case was taken up with the Government authorities with a view to his war disability being treated, and after several letters had passed he was admitted to hospital. Then the Branch took up the man's right to a pension, and succeeded in having the matter favorably considered by the Board of Pension Commissioners. When he left hospital, temporary employment was found for him—road building under municipal arrangements. and an application was forwarded to the Civil Service Commission for his employment in one of the Government Departments. This was well recommended by officials of the local Branch, and in due course he received a permanent job. He is receiving a pension, his wife and children are happy and the family is a self-supporting unit. Is this worth while? Yes, a thousand times yes. I have a vision of this spirit of true comradeship spreading throughout the Dominion; of this helpful work going on in every large centre from Halifax to Victoria. I have a vision of the Association becoming more and more active in its task of being guide, philosopher and friend. to the ex-soldier. If a man who has served in the Great War can hail all others who served as "Comrades," how much more so are we who have served in the same Regiment, and understand the privilege which has been ours at some time in belonging to the good old R.C.R. This year the Regiment celebrates its fiftieth birthday, and I suggest that those who have served in the Regiment, made its traditions, won its honors, and kept the spirit alive should be equally as interested in the celebrations as those who now turn out on parade. They should certainly have some voice in the manner in which the celebrations shall be carried out, and in any committee, parade or ceremony, the representatives of all Battalions should take part. Last year, it was my privilege to see the Governor-General's Foot Guards receive their Colors at Government House, Ottawa, and the most inspiring thing about the whole ceremony was not the presence of His Majesty's representative or the Empire's statesmen attending the Imperial Conference, not the actual presentation of the Colors loaded with their battle honors, but the march across the parade ground of the 2nd Battalion veterans—the men who had actually won the Honors which the G.G.F.G. now have the honor of carrying. The Guards realized the vital part of the ceremony, and it was the most wonderful, the most inspiring sight it has ever been my privilege to Witness. Without it, the event would have been an empty sham. Let every officer, n.c.o. 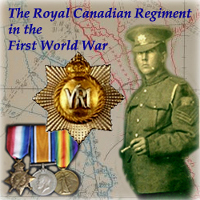 and man of every Battalion of the Regiment feel that only death can sever his active connection with the R.C.R. It is true, is it not? The connecting link is the Old Comrades Association. Let's make a go of it. 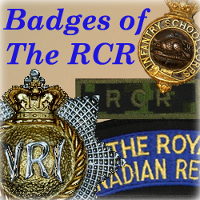 The R.C.R. never yet gave up a job it started out to perform, and when such an association can do so great an amount of good, why, Gentlemen, it is up to each and every one of us.